I hope you are having a good week and staying cool! I have an extra special dachshund video to share with you today. 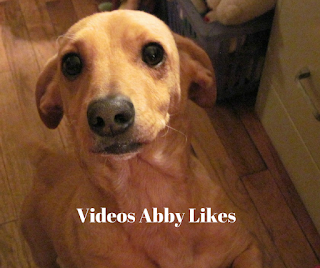 In this short (1 minute) video you will meet Finn the dachshund. He had a favorite toy named Piggy when he was a puppy. He chewed the toy up but his person found another toy just like it -- five years later! Finn is so excited to meet Piggy again that he makes some of his puppy noises again. It is a very sweet video. If you have a pet, does he or she have a favorite toy? I have several favorites and like to cuddle with them. 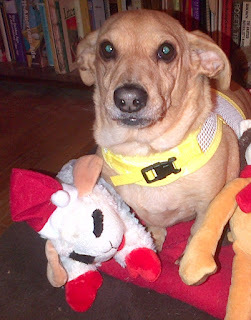 One is a Lamb Chop toy in a little Santa hat. The other is a little fuzzy tan dog toy that belonged to my late brother Barney Fife. I love it very much and like to take a nap with it. I hope you have a good weekend! Thank you for visiting my blog. What a sweet post! Penny recently rediscovered an old favorite toy under the couch. Oh my goodnes what a sweet pup! So happy and playful! Love them! How adorable! My oldest dog used to have some favorite toys. Now he is just a grumpy old man pup lol! 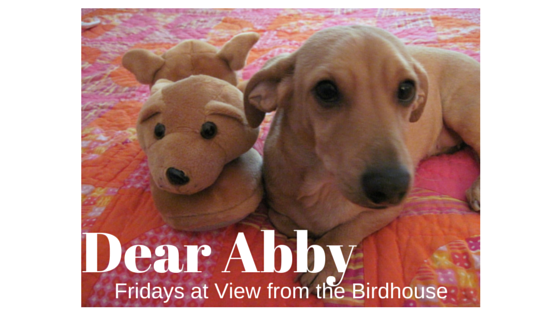 Abby is really sweet. After reading your post. I am feeling like to meet him. Aww such a sweet and heartwarming post! I love it! My dogs are attached to their fav toys and I think they would be devastated if they went missing! Such a cute dog!!! This is such a happy post! what a cutie, I really want a pup but hubby just won't have it. My dog has a rubber bone that he loves like this. He has destroyed just about every other toy we have purchased for him. Our dogs always liked balls or ropes as opposed to a stuffed toy. oh my goodness! How sweet! Thanks for writing friends! I loved hearing about your dogs' special toys, too.